Silence is golden and noise reduction in a diesel generator can be an art form that includes special attention to insulation, housing, air flow and aesthetics. The Pulsar PG7000D takes all of these into consideration and has developed a 5500 peak watt (5000-Watt rated) diesel generator that operates at just 70 dB or less than many gasoline models. Add to this a 4 Gal. fuel tank that will allow the unit to operate for up to 9.5 hours between refills, easy-to-read fuel gauge, maintenance free battery, mobility kit and 5-outlets for everything from 120-Volt to 240-Volt to 12-Volt operation and you have a quiet giant willing to serve for many years to come. 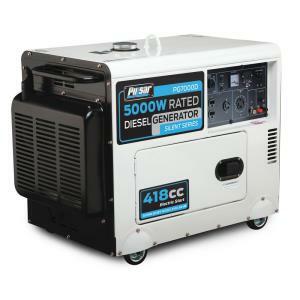 Tbook.com crawls the web to find the best prices and availability on Generators and related Tools and Hardware products like Pulsar 5,000-Watt Diesel Powered Electric Start Portable Generator. For this page, related items include products we find that match the following keywords: "Generator GENERATOR" at our vendor partner Home Depot. Pulsar 5,000-Watt Diesel Powered Electric Start Portable Generator is one of 152 Generators and related products listed in the Tools and Hardware section of Tbook.com If you have any questions on this product, please give us a call at 734-971-1210 during the hours of 9am - 5pm EST for assistance. Thank you for shopping at Tbook.com, the Internet Department Store!